The Toronto Real Estate Board says there were 8,014 residential real estate transactions through it’s system last month, this result was up 5.7 per cent compared to February 2016. The average selling price for all types of housing was $875,983 up 27.7 per cent over the same time last year. The demand for home ownership in the GTA continues to grow and remains strong. The number of new listings entered into TREB’s MLS system in February were down by 12.5%. While supply is so low we can expect to see prices continue to rise at the rapid rates we have seen over the past few years. The growth rate for condo apartment prices since last year has been in the double digits, possibly as a result of strong demand from many first time buyers. It seems that the 2017 real estate market has started with a bang here in West Toronto. Many homes in our focused neighbourhoods went into competition with multiple offers, leading to an abundance of houses selling for drastically higher than list price. It is very much still a seller’s market here but there is still value to be found in certain neighbourhood pockets! It’s important to remember that the real estate market is a micro-market business and varies drastically across the country, within provinces and even within the city in different neighbourhoods. Our business is focused on Toronto’s West end neighbourhoods roughly from Roncesvalles out to Etobicoke. We’ve broken the statistics for February across each of these regions. The housing market in this area didn’t have a huge volume of sales in February. 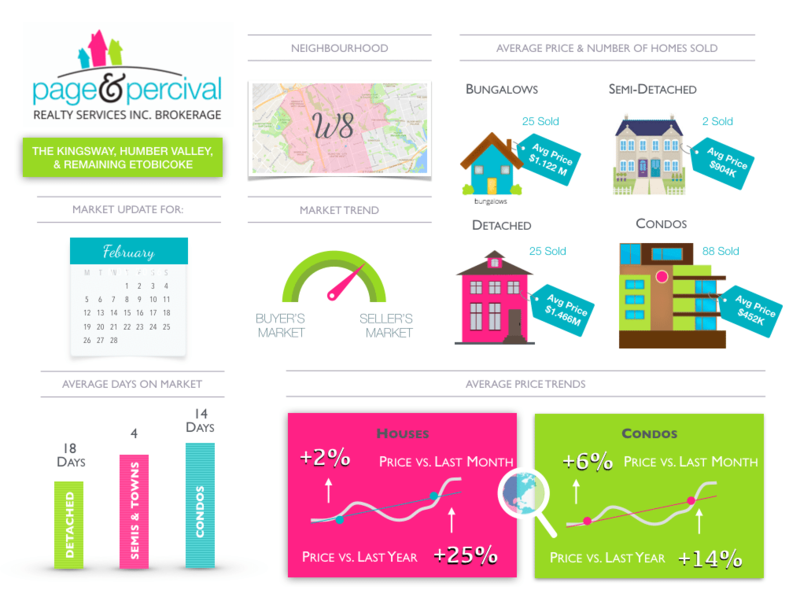 Looking at the data we have shows us that average house prices had increased by 3.8%. Things moved a little slower in this neighbourhood than we would usually expect with the average detached home taking 38 days to sell. However the condo market has performed very well since last year, prices are up 13% since February 2016. 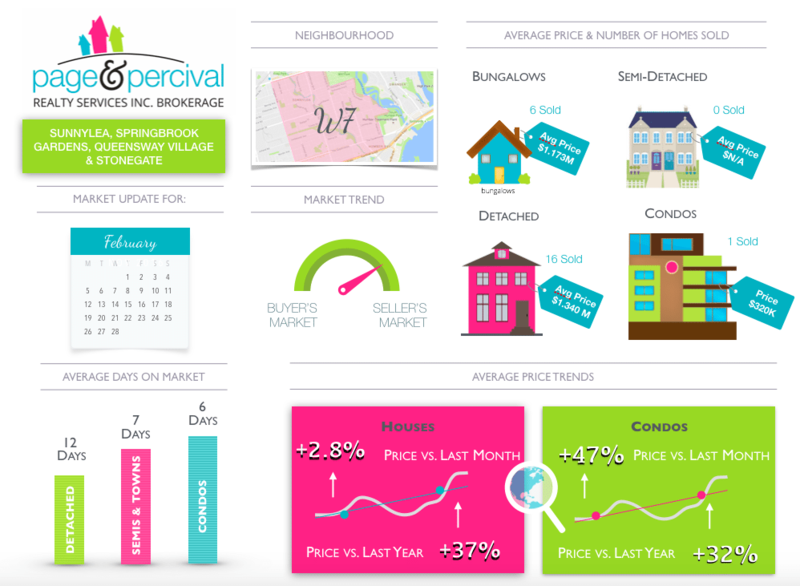 It looks like the market was pretty healthy in this area for February with the average detached home costing $1,248M. As per usual, homes were selling pretty quickly in these neighbourhoods where a seller’s market remains. The average detached home took 11 days to sell. These neighbourhoods are still very much in demand for a whole variety of buyers, prices have increased by 17% since last year. The condo market saw a healthy appreciation of 8% over last year and average price has increased by 2% from last month. House prices have increased by a whopping 31% in this area since last year which is fantastic news for anyone who may have purchased in the area at that time. Although demand is very strong there is still value to be found as the average deatched home sold for around $1.021M. We still think that this area presents some great opportunities for first time buyers. It would be key for those buyers who are looking for some value to get into these neighbourhoods now. It also looks like tho condo market is doing very well in these areas as the average price has increased by an impressive 13% since last month and 24% since last year. The average selling price of a home has increased by 37% in this area since last year. This could be due to the fact that there were many more high-end and luxury homes sold in these neighnourhoods than last year. There is a lot of development happening in this area. Developers and builders are purchasing small bungalows and are building mega luxury homes in their place, which are selling in the 2 million range. The condo market here was up 32% from last year. It must be noted that we are only comparing very small sale volumes in this specific area, so gaining a true increase in value can be difficult in this case. 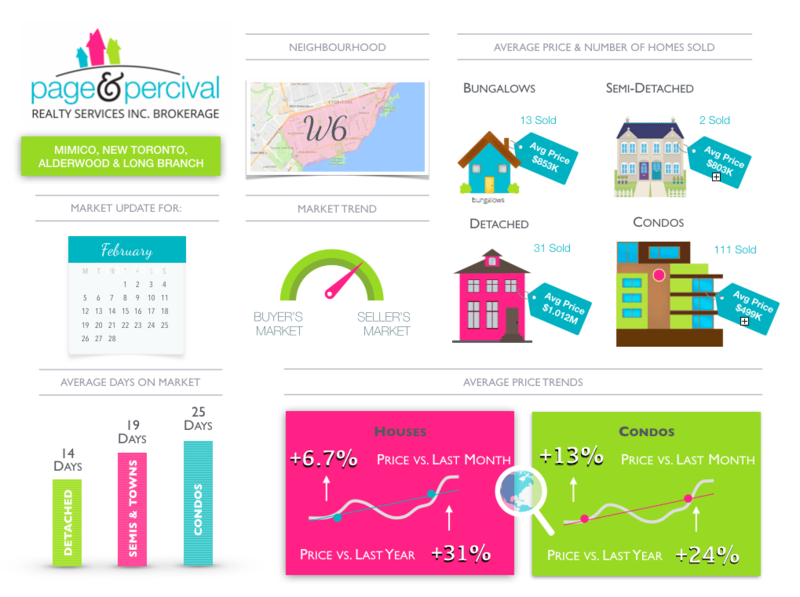 This area had a steady month with a 2% increase in prices since January. An increase of 25% in sale prices from last year indicates that these neighbourhoods are still very popular for those who want to transition to a larger home but still remain close to the city. The condo market performed very well with average prices up 14% over last year and a healthy increase of 2% since last month.